Stanley King is ready to represent his home state at the next level. 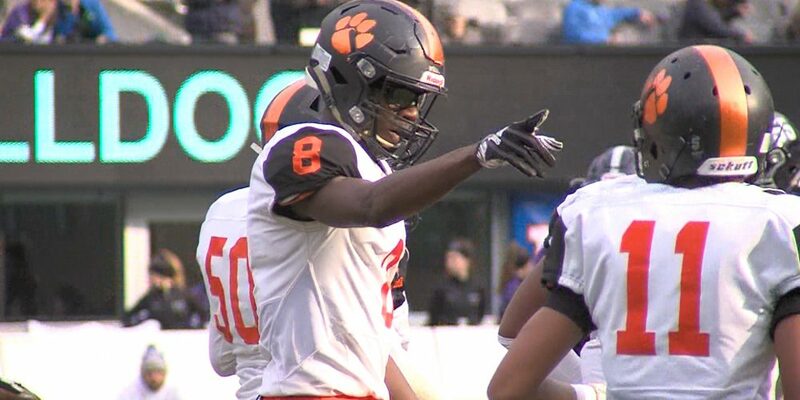 The 6-5, 175-pound wideout hailing from Woodrow Wilson High School in Camden put pen to paper Wednesday morning and officially signed his National Letter of Intent with Rutgers University. King has left a legacy as one of the best playmakers in South Jersey history. He was named an Under Armour All-American this season and posted 148 receptions, 2,516 yards and 28 touchdowns over his high school career. No. 8 was the main offensive weapon on a Woodrow Wilson squad that scored 34 points per game, accrued a 9-4 record and won the South Jersey Group 3 sectional title in a 22-14 win over Burlington Township. King was one of 12 wide receivers selected to JSZ’s All-Zone statewide team, joining the likes of Charles Njoku (UCLA), Jaaron Hayek (Villanova), John Metchie (Alabama), Ayir Asante (Holy Cross) and fellow Rutgers commit John Guaimano. King selected Rutgers over Western Michigan, where his high school quarterback and JSZ Zoneman Finalist Nick Kargman is committed to. King was initially verbally committed to Louisville but decommitted just before his senior year started.